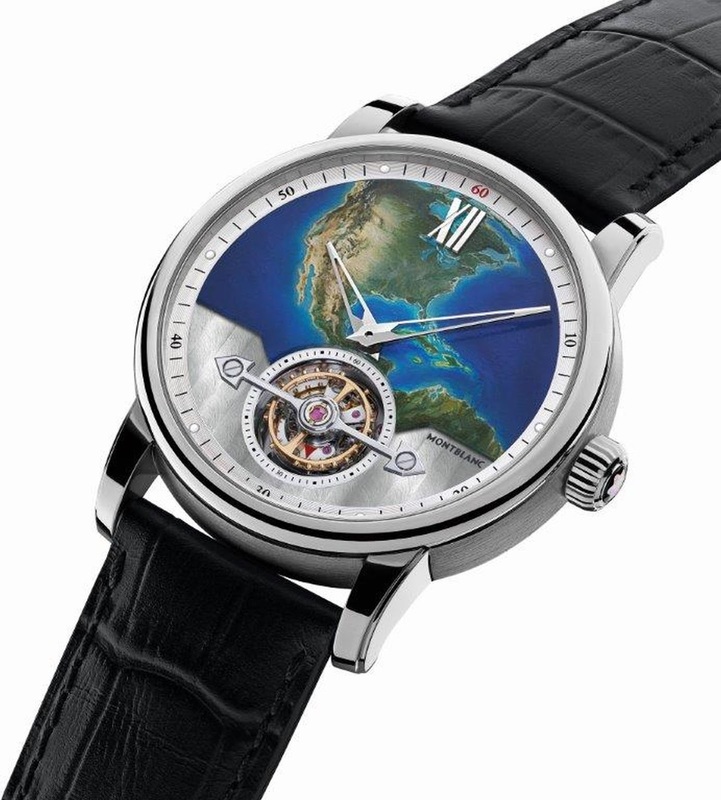 A close look at the ExoTourbillon Slim Limited Edition reveals a 42 mm white gold case with a number of subtle design details, including a thin bezel with satin finishing on the border and horns that, while straight from above, are slightly curved on the underside for maximum comfort on the wrist. This limited edition features the Calibre MB 29.24—powered for the very first time by a micro-rotor decorated with a Côtes de Genève en Eventail pattern that reveals an undisturbed view on this patented manufacture movement beneath a large sapphire crystal on the back of the timepiece. Montblanc has chosen not to feature the crown setting quick stop-second indication on this model so as not to cover the hand-painted dial. The quick stop-seconds are indicated on the tourbillon cage with an eye-catching red arrow. This practical quick stop-second function is made possible thanks to the construction of the ExoTourbillon, which halts the screw balance by means of a tiny spring, allowing the user to set the time to the exact second. The quick stop-second mechanism instantly stops the balance from rotating, instead of halting the tourbillon cage, which can cause the balance to continue swinging and upset the precision of the watch. The quick stop-second mechanism can be achieved by pulling the crown at 3 o’clock. The Montblanc 4810 ExoTourbillon Slim Limited Edition is fitted with a black alligator strap and has been subjected to over 500 hours of real-life testing by the Montblanc Laboratory Test 500.